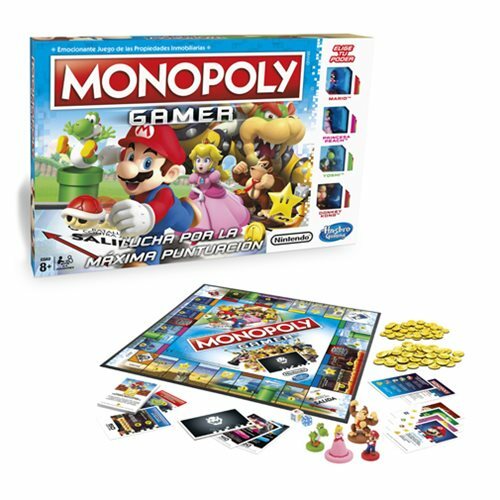 It's the Monopoly board game with a Nintendo twist as it joins forces with beloved Nintendo characters. Instead of standard Monopoly tokens, the Monopoly Gamer edition features Super Mario characters, each with their own unique powers. Buy property, pay rent and battle for points! The game ends when Bowser has been defeated. Player with the highest score wins! Includes gameboard, 4 Super Mario Character tokens (Mario, Princess Peach, Yoshi, and Donkey Kong), 4 Character cards, 4 Reminder cards, 8 Boss cards, 16 Title Deed cards, 1 Numbered die, 1 Power-up die, 90 coins, and game guide. Ages 8 and up.